Founded in 1990, these are a professional hockey team based in Cincinnati, Ohio who have played in the ECHL and the International Hockey League. The first franchise to use the name Cincinnati Cyclones was founded in 1990. The team played their games during this time period at the Cincinnati Gardens. They lost in the first round of the playoffs in the 1990-1991 season. In the 1991-1992 season, the Cyclones lost in the Kelly Cup semi-finals. The team's owner at the time, Doug Kirchoffer, was granted an IHL franchise who chose to move the Cyclones name to that franchise and sell the ECHL franchise to the ownership group that moved the franchise to Birmingham, Alabama to form the new Birmingham Bulls. The average Cincinnati Cyclones tickets price will cost you between $38 and $39, if you are looking for the cheapest seats then catch the event being held at the US Bank Arena, Cincinnati on 23/04/2019. The average ticket will cost you the highest on 24/04/2019 at the US Bank Arena, Cincinnati. Minimum get in price is for Cincinnati Cyclones tickets is $31 for the event being held at the US Bank Arena, Cincinnati on 23/04/2019 , there are some venues that have a much higher get in price, for instance the cheapest seats at the US Bank Arena, Cincinnati on 23/04/2019 will set you back $31. When dp the cincinnati cyclones ticket go on sale? When is the next cyclones game coming up and where can i get the cheap tickets to cincinnati cyclones game. I want to check the us bank arena seating chart before proceeding with my purchase. How can I get one? Please suggest some cincinnati cyclone discount tickets with better views from seats at the venue. Thanks! Where do i find info on us bank arena seats? 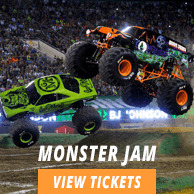 I want to make sure that tickets im looking at are worth spending bucks on! Sure! While choosing Cincinnati Cyclones tickets make sure to check out our venue map that will give you a nice idea about seating or contact our Livehelp Reps for their recommendation. Its always advisable to check the Venue Map for a better seating idea before deciding on tickets. Please go to our webpage for US Bank Arena to check the Venue Map. Please visit our Cincinnati Cyclones tickets page for dates and our inventory, for the cheap tickets. Thanks. Kindly contact Live Help and ask for the desired seating chart. Cincinnati Cyclones tickets are now up for grabs!